Summer is here and kids are out for 72 days of summer. If that sounds daunting (it does to me) then we have a great escape for you--classes! We have tons going on this summer. But first our Instructor of the Week...Introducing Marilyn Gardiner. Marilyn has a passion for creating jewellery. This is her new lease on a life — she is a retired teacher and school-board computer consultant. Three interwoven paths are developing in her life. The first is a love of pattern and design from different eras and cultures and its reflection in her bead work and designs. The second is her enjoyment of teaching adults, and the third is the satisfaction of developing beadwork kits with clear, step-by-step directions and diagrams that really work with learners. Many of her beading skills were self-taught using books, the internet, and trial and error but she enjoys seeking out and travelling to learn from experts such as Don Pierce, Virginia Blakelock & Carol Perrenoud (bead loom), William Hodge, Marla Gassner, & David Chatt (off-loom beading), Jennie Might (bead crochet), Bette Kelley (broadcollars), Rod Owen (Kumihimo), Jennifer Campbell & Sharilyn Miller (wirework), Jay Humphreys (PMC), Fred Zweig (silverwork), and Joni Kisro (chainmaille). She teaches classes in Waterloo Region, Toronto, Texas and Arizona. Marilyn has been teaching at Beadfx for almost as long as we have existed and is an exceptional teacher. Her classes are always fantastic and detailed, leaving her students feeling excited and confident. Marilyn has two classes coming up this month on Saturday July 11th. Earrings and Pendants from 10 to 12:30pm, this is a beginner class. And a beautiful intermediate level chain mail class, the Foxtail Bracelet. Also going on over the next few weeks we have Robert Burton's Wire Working and Wrapping 101 beginning on Monday July 6th. This class runs for 3 weeks from 6-9pm and always fills up fast. It has just gone up, so I would register immediately if interested. A little out of order, but we also have the Art Clay Silver Level 1 Certification course with Heather Bell-Denison from July 3rd to July 6th. There are only a few spaces left in this highly anticipated class. 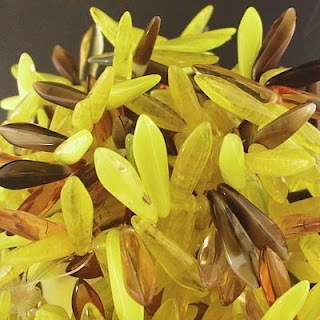 Learn to Make Glass Beads weekend with Amy Waldman-Smith on July 11th and 12th. And Charmed I'm Sure on Sunday July 12th from 10am to 5pm. We have also added a few more Catherine Winter classes, How to Price you Jewelry-Starting a Microbusiness on Thursday July 16th from 6 to 9:15pm and again on Thursday August 13th. Please the following change--Catherine Winter's class that was scheduled for Thursday July 2nd has been cancelled due to a scheduling conflict. Don't forget about Happy Hour Torching on Thursday from 5 to 9pm, buy one hour get one free! Let's talk about earrings! or ear rings - as you prefer. Earrings are fun and quick to make - you can easily make up pairs to go with every mood, outfit, holiday, day of the week, etc. Even before I made jewelry - I could easily go more than a month without repeating a pair. Of course, the findings are what make an earring work. A necklace or bracelet is mostly about the content - the beads or whathaveyou - and the clasp is a nice finishing touch. But with earrings - the findings - the mechanical bits, if you will - set the tone of the earring. Dangley, drippy vs stud, etc. Here's a review of earrings findings. The simplist of all are "Shepherd's Hooks" or "Fish Hook" style earrings - which is - to put not too fine a point on it - a piece of bent wire. In fact - you can buy a nifty little tool - a jig and bending device - that allows you to crank out your own earwires by the score! The downside to this very, very simple finding is that they can fall out of your ears and you lose the earring. Either they slide forward and slide out, or they snag in clothing and are pulled out. So a more secure option, but nearly as simple, is the "Kidney Wire" - which adds a little hook to catch the back of the earring in, to close it up and become a loop. Usually delicate and light - they don't add much to the weight of the overall piece. However - these little plastic stoppers are designed to slip over the end of the shepherd hook or fish hook style, and stop them from sliding out - so they are an attractive option too. The more substantial "Leverback" - in both a roundy style and an elongated style are much more secure to wear - and eliminate the little hook that can snag on clothing, hair, etc. The more round-in-profile style is often referred to as Euro-style. Leverbacks are generally more substantially made - they have moving parts, and so are a more expensive finding to make. They can be a little more awkward to get into your ear as well. But they are very secure in terms of staying there, and they don't snag on things. These all have in common that they have a loop at the front for hanging the decorative part of the earring off - so they are used for "dangly" style earrings. The leverbacks often have some decorative element too - from a simple ball or a little fan shaped wedge of metal, to make them look less utilitarian. Stud or Post style earrings make for a more minimalist design - if desired. You need to pair these up with a "back" - to slip over the back to retain them. This is usually a "butterfly" back - or nut - that slips over the earring to keep it in place. The wider, flatter style - also known as a "clutch" - has a built-in disk to make the earring back wider. The wider style is good for heavier earrings - as it spreads the weight and pressure out over a larger area - making the earring more comfortable - or changing the exquisite pain into a dull ache - as the case may be - depending on just how heavy you made them! Studs can also be a flat disk for gluing an item onto. This is especially good for those who don't want a long, dangly earring. Clip-ons come in a surprising number of styles, actually. They can be light and airy, with a simple loop for hanging. Or a more decorative style. Or they can be a speciality finding - like a perforated disk - for wiring small beads to. Chandelier is a term used for particularly large, ornate, drippy style of earrings - much like a chandelier light fixture. These findings can be hung from almost any style of earring that has a loop - from shepherd's hooks to leverbacks to clip-ons, and are hung with small beads or crystals. Be careful not to get carried away and make them too heavy! Hoop earrings are a simple style that are more oriented for viewing from the side - excellent with pulled up hairstyles, and they won't widen the look of the face visually the same way a wide, chandelier style might. That pretty much wraps up earrings. Because earrings need to remain light - so that they are comfortable and wearable, and they seldom get the hard knocks that bracelets do - you can attach the beads that you use with a "simple loop" as opposed to a "wrapped loop." Stephanie Dixon - our crochet instructor - fell head over heels madly in love with these stick pearls - and whipped up this little baby! Marg makes awesome beady stuff. Stuff that blows my mind for patience, skill and precision - and then she's all "what - this little thing - I just whipped it up!" This past trip to Bead and Button - where she signed up for classes - resulted in these stunning lovelies! She assures me that this stunning extravaganza of 3 mm crystals (something like 5 gross of them!) was really pretty easy and quick to do. Oh yeah - right. And then there is this lacy item - isn't this divine? And finally - this work-in-progress. Love these colours! Orders are still going through ok, but we just can't email! And lots of cool new glass beads - from daggers to donuts. 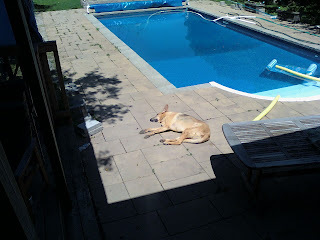 You knock yourself out working 18-hour days, struggling to pay the mortgage, do-right by family and friends and be a good, responsible adult - and for what - so your dog can snooze by the pool. Yay! I have begun to get the summer schedule (and a bit of the fall schedule too)up on the site at last. Before I get into that, our instructor of the week is Amy Waldman Smith. Amy has been teaching Glass Bead Making at Beadfx since 2004. Form and symmetry are hallmarks of Amy's beads. She pays close attention to the technical details and strives towards uniform, functional beads. She has been making glass beads since 2001 and began working from her home studio in Richmond Hill in 2003. Prior to that, she haunted the beadFX studio in every spare moment. Amy has a number of two day weekends coming up this year. Her class this weekend is full, but do not despair there are more--next one is July 11th and 12th. This is a great way to discover the art of making glass beads! There are a few more really great classes this June. Dwyn Tomlinson's Introduction to Lampworking runs from 4-8pm on Wednesday June 24th. Catherine Winters How to Have a Successful Craft Show is Thursday June 25th from 6-9:15pm. If you would like to spend more time with Catherine you can on Thursday July 2nd from 6-9:15pm, How to Price your Jewelry Starting a Microbusiness. Friday July 3rd to Monday July 6th is the Art Clay Level One Certification Course with Heather Bell-Denison. All of the details should be up on the site within the next day or two. 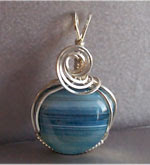 Monday July 6th from 6-9pm we have Wire Wrapping 101 with Robert Burton. This class always fills so do not delay in registering if you are interested. Thursday July 9th is the Bling Ring with Stephanie Dixon from 6:30-8:30pm. Sunday July 12th is Charmed I'm Sure with Heather Bell-Denison from 10-5pm. That is just the first half of the month too!! Don't forget about Happy Hour Torching from 5-9pm on Thursday. As always Dwyn will be in around 7ish. Buy one hour and get one free. Make sure you call to reserve your torch. Happy Beading and keep checking for more class news. What's Up at Beadfx-- Classes of Course!